The Model Congress Program at BHS is in its Third Decade continuing to offer an exceptional educational and civic experience to BHS students. Over 2000 students have participated in this program, which has attended over 100 conferences and related events since 1994. In historic Boston, Hartford, New Haven, New York City, Philadelphia, Princeton, San Francisco, and Washington, DC, BHS students have taken on the roles of Congress People, Supreme Court justices, journalists, district court attorneys, juries, lobbyists, presidential cabinet officials, and more and done so with excellence and award winning performances. Students have won over 500 awards for their exceptional efforts, making Branford a formidable force at these competitive conferences. Over a five-day weekend, in an Ivy League setting run entirely by premier college students, delegates are engaged in many hours of debate with high school peers from all over the country on important issues of democracy. They also take part in a variety of other learning and cultural activities. It is little wonder the experience is so appealing to and respected by students and supported so generously by many local (and several non-local) sponsors. On many levels a Model Congress conference is a unique and exceptional learning opportunity, as captured on our website - www.bhsmodelcongress.org -visit for the latest conference schedule and links, many many photos, student reflections, sponsor opportunities and more. This year the program returns once again in full force, offering every student who is sincerely interested and qualified, an affordable opportunity to attend at least one of The Major Conferences. 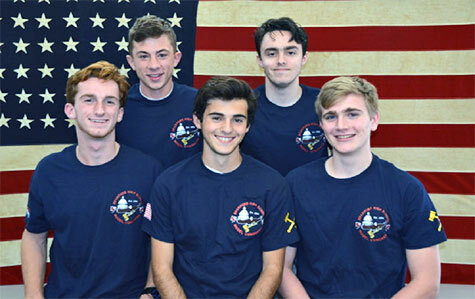 Led by teacher & BHS MC Founding Father James Petela, a select number ofBHS students will participate at "The Major MCs" -Yale, Princeton, Harvard, Penn. The program is led by a much needed coalition of talented and dedicated officers, Prezs/VPs, who were selected based on their previous years' model conference performance, leadership, and peer recognition. This year's current Senior Presidents pictured above smiling with great eyes & teeth :), will not only help their BHSMC peers learn how to become effective and engaging delegates, but also lead and inspire them by their model actions, encouragement and award winning performances. They are our best, along with their officer peers. The Model Congress experience offers our students learning opportunities on many levels. First. students learn in depth about our system of government by simulating the political, legislative, and judicial process. For example, those who take on the roles of representatives or senators research issues and write brief bills that they bring with them to conference where, dressed in western business attire and under parliamentary procedure, they present and argue its content and value with their committee peers whom they hope to win over. The level of engagement trying to pass or shoot down each other's bills is one that is exciting, often intense, and sometimes humbling. Students learn to defend their ideas and speak on their feet. and in their seat. on a number of issues. Their speaking abilities and self confidence improve considerably and even when they are not speaking, they are listening and observing their peers, many of whom are strong and sophisticated in their abilities. Supreme and district court competitions also significantly challenge our students to articulate arguments and to speak and think on their feet, quickly, creatively, dramatically, and cogently. Last year at Harvard, 2 BHSMC DCourt teams were effective and entertaining in their performance. Overall, students return from a weekend of over 25 engaging hours in committee/court sessions with a greater appreciation and awareness for our government and current events as well as being academically and intellectually challenged during the process. On another level, BHS students also learn about college via campuses, courses, and students. At the Yale, Harvard, and Penn Model Congress, for example, students have taken advantage of campus tours and classes ranging from Political Science to Interpretations ofthe Bible, Chemistry, and Anthropology taught by world-renowned professors. In addition to the college campuses, BHS students also have opportunities to sightsee and explore the historic cities via bus/walking tours, and even runs/photo-op jogs led by Mr. Petela. Visiting the monuments, Arlington Cemetery, and Smithsonian Mall in Washington, DC, Independence Hall and the Liberty Bell in Philadelphia and Freedom Trail in Boston are always moving and patriotic experiences. Other events while at the congresses have included off-Broadway shows such as Blue Man Group (an annual event for Harvard MC), Alcatraz and the Golden State Bridge, group-bonding delicious dinners, shopping with parent's credit cards, concerts, the Mr. Mac Veigh Rocky Balboa Run in Philadelphia, and of course the final Congressional dances, where BHS students are always an award shaking prized presence! Needless to say, our students cannot help but be motivated, inspired, entertained, and enriched by such extra opportunities. On a final level, student's personal/social skills and confidence are strengthened and enlarged. Students get an opportunity to get to know their peers from BHS more closely, especially after rooming in a hotel together in close quarters for four nights! They not only meet new BHSers, but they meet, compete, collaborate and form friendships with other students from all over the country. Many new friendships continue even to this day. Often alumni return to BHS and comment on how they have recognized quite a few model congress students their first year at college. Returning alumni have also praised how their model experience has helped them in their college studies and classroom discussions and debates. Some have even become involved with their college Model Congress Programs, but now on the other side as chairs and leaders for the HS students. And many BHS MC alum visit and help chaperone when we are in their respective college city. Because of the value, success, and popularity of BHS MC over the past few years, there are many students who want to join the program and attend the conferences. This can make the selection process very difficult and challenging. However, there are several strong requirements one must meet if they are to be considered, most notably, initiative, maturity, seriousness, commitment, reliability, seniority (or past conference attendance), academic strength & some luck! The process of selection includes an essay application (read and evaluated by advisors), teacher and model congress officer feedback, and possibly advisor and officer interviews. Other factors in the conference selection process include having our groups diverse with a mix of males and females, some freshman and sophomores, but mostly sophomores, juniors and seniors for the overnight trips. Officers have first choice of conference choice, roles, and rooms. For the chosen BHStudents, weekly meetings are led by MC Officers in the months prior to conferences to prepare delegates. Officers teach the new and returning members how to write and to present legislative bills or court cases, to use parliamentary procedure, and to practice public speaking. With many experienced and award winning officers, we have the resources to make all BHS delegates comfortable, confident, and award-capable going into each conference. In past years, our state representatives have visited and engaged our students on the legislative process and how to be an effective politician. We hope to have them visit and engage us again this year and in the future. Look for BHS Model Congress to continue its campaign of success in preparing our students to become model students and citizens. Many news articles and student reflections (see website) over the past years have paid tribute to the model congress experience; anyone is welcome anytime to stop by Mr. Petela's room in A23 where many of them are displayed outside his classroom on the hall wall. You are also invited to come inside the classroom and view the many photo albums and 8xl2's on his walls. Reading these articles and reflections, and viewing the photos will convince you of the value and fun BHSers experience as Model Congress delegates. Finally, don't forget to check out our much improved website! - www.bhsmodelcongress.org or contact James Petela at jpetela@branfordschools.org Stop by anytime and cast a vote for BHS MC, truly a prized program dedicated to the development and enrichment of Branford students.